Photocopy of ALL mark-sheets that you are requesting TRANSCRIPT for OR a photocopy of the consolidated mark sheet. Photocopy of the payment proof (called bank Challan) for transcript request. Application for transcript addressed to ‘Controller of Examination‘. The fees is charged based on your year of passing out from Guru Gobind Singh Indraprastha University counting back from today’s date. Please carry CASH for easy transaction. No online service is available. Takes minimum of 25 working days excluding Gazetted holidays, Saturday and Sunday. No urgent or tatkal or emergency service available. Hence, please plan ahead. IP university does not have option to mail the transcripts at this time. So, the only option is to get your family/friend collect the transcript and then mail it to WES address directly from the post office located within the IP university campus. There is no official GGSIPU transcript form. Write transcript application yourself. You can copy and paste this sample transcript form IP university. Replace the RED markers with your own information. Payment is accepted in Indian Bank branch located inside IP University, Dwarka, Delhi campus. Bank will provide with payment receipt (called Challan). Get all mark-sheets and degree photocopied. No notary needed – 1 copy. Get Bank payment receipt (challan) photocopied – 1 copy. Get your application (that you wrote) photocopied – 1 copy – for your records only. Submit at university transcript window located at IP University controller of ‘examinations‘ center at Dwarka, Delhi campus. Can relative or friend apply for IP university if I can’t go in person? Yes, anyone can submit the application and receive the transcripts after 25 days. You need to provide an authority letter to submit or collect transcripts on your behalf. The transcripts are taped and signed by university official to make tamper proof. You should NOT OPEN it yourself. Wherever you need to submit it, you have to submit it as it is. Most people need it either for applying to universities in USA or immigration to Canada, Australia and other countries. Do we need send an attested copy of Degree certificate as well along with the transcripts? When I login to my WES account it says I can send the degree photocopy directly to WES & does not mention anything related to attestation. I am not aware of specific WES requirements. Hence, cannot comment on it. WES rules are changed from dec 1, 2018. Now, WES wants the transcript to me mailed directly from University. No personal courier are allowed now. Will GGSIPU University will send transcript to WES directly? University does have the option of mailing. You have to send someone to collect your transcripts and mail them directly to WES from the post office located in campus or nearby. I think so. University will have to accommodate the requests as that’s the only process. I checked with GGSIPU University and they replied with a big No. They will not send directly to anyone. You can collect transcript from University. I am search for WES alternative. Please let me know, if you find more details on this. Sure. Will share as and when I hear something. I have sent over my documents to CES for assessment, as they are still accepting transcripts sent by students as long as they are stamped & sealed. Yes, that makes sense. WES has made complex and more costly now. The guy in IPU examination cell also told me that you can send the transcripts to wes on uni behalf via post office inside campus premises. He told me that don’t put your address in sender’s details, but only put “To” address. As per him, many students are doing this now. I am not sure about this method as I haven’t tried it, so if someone could confirm. 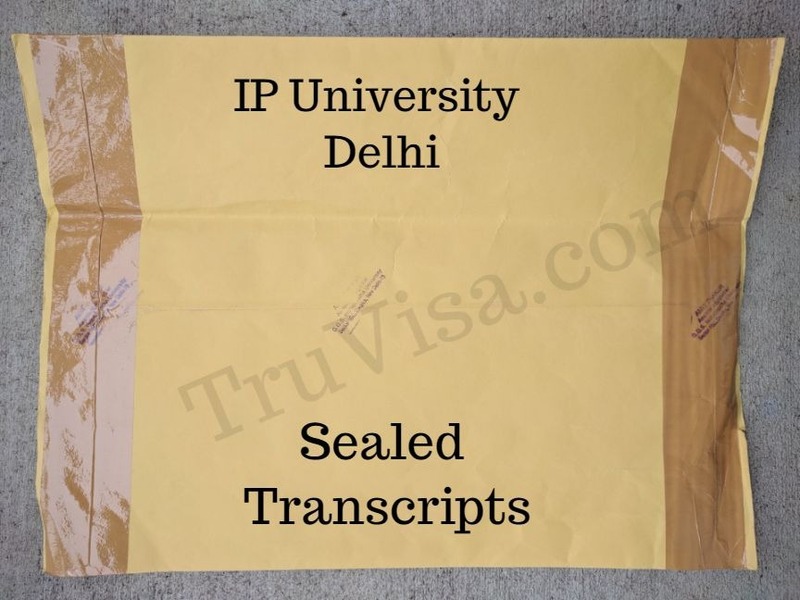 I had recently send a person to the university in my absence to apply for sealed transcripts. He was told that the university does not provide any such document.Have the norms changed for this. i tried calling the university but as like any other govt. office nobody picked up the phone. I am not aware of any such decision by IP university and if they have stopped it. 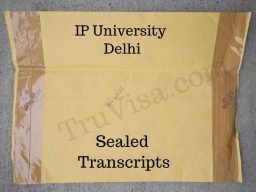 There is a special window counter at the IP university Dwarka campus for Sealed transcripts. Did your representative ask the correct question there? I am assuming that my representative didn’t ask the right question to the right department. I will have to go an see for myself only. 1. As far as i know, they do not send it by mail to your address at this time. Someone has to go in-person and collect it. 2. You can get the transcript for consolidated mark sheet only. That’s what most people do as it has all the information. 3. Quantity means the number of copies you need. Each copy is charged. Mr. Anil, I sincerely appreciate such a simplified article which showed me the steps I needed to perform in order to obtain my transcripts. Also, I have a couple of questions. Firstly, do we have to collect the transcripts after 20-25 days or are they sent on our registered address by the university? If we have to collect it, do we get any intimation from the university that our transcripts are ready and we can come and collect them? Secondly, I would like this done with minimum charges possible, therefore, I’m applying for 1 transcript. I read your article and had some doubt in the consolidated transcript and individual transcripts. My purpose to get transcripts is WES evaluation (ECA). So do I need to say specially in my application that I want consolidated transcript or should I just say, that I require transcripts for my MBA course. and quantity should be 1. Quantity denotes the number of copies of the transcript, right? Or does that denote individual or consolidated transcript? It depends on your specific requirement for the transcript. if the purpose is to send transcripts for immigration’s educational assessment, then almost all of them accept the consolidated mark sheet. You have check with your purpose’s assessment company or college or institution if they are okay with consolidated mark sheet. How much do we need to pay for 2 copies of transcript ? Fees per transcript is Rs 1000 if you passed out less than 5 years ago. For 2 transcript, it is Rs. 2000. I am not sure about it. You will have to ask the university. I guess they do provide as applying g for foreign universities is a standard process.